Hypertension is the most common risk factor for cardiovascular disease and stroke. High blood pressure is also responsible for other serious problems, such as chronic renal failure, aneurysms and lesions in blood vessels of the eyes. As it was not enough all the possible complications, hypertension has another problem is a silent disease that causes no symptoms in most cases. Therefore, the only way to know if someone has hypertension is through blood pressure measurement. But what are normal blood pressure? In this article we show what are the desirable values of blood pressure for teens, adults and seniors. Blood pressure is the pressure that the blood exerts on the walls of arteries. Let's make an analogy: imagine an empty and withered all hose. As the water opened, the pressure inside the hose rises and its walls are distended. As the hose is an open system, however we open the tap, the fact that the water come out on one end prevents the pressure on the wall of the hose is too high. In the human body, however, the circulatory system is a closed system, if the pressure inside the vessel is rising, the blood has nowhere to go, and the only thing that the body can do is distended blood vessels in order to behave the circulating blood volume. Theoretically, the blood vessels are self-regulating, i.e., they compress or dilate according to the circulating blood volume in order to maintain more or less constant blood pressure. If the blood volume decreases slightly, the vessels are compressed (vasoconstriction); The volume of blood increases slightly dilate the vessels (vasodilatation). Of course there is a limit, if the blood volume decreases or increases too excessively, however the arteries to constrict or expand, they will not be able to keep blood pressure at an appropriate level. So you can already understand that one of the causes of high blood pressure is an excessive increase in the volume of blood within the blood vessels. This excess usually occurs when the body retains too much salt and water. However, most hypertensive patients have excess fluid in the body, at least not enough to overcome the expansion of capacity of vessels. What happens is a failure in the ability of self-regulation. The arteries are always compressed more than is needed for blood pressure becomes normal. The origin of the loss of the self-regulating ability blood pressure, which leads to hypertension, is complex and not well understood. It involves genetic factors, amount of salt (sodium) in the body, kidneys' ability to cope with the volume of body water, production of hormones that act directly on the wall of blood vessels and their health of the arteries, which must be able to contract and dilate properly. The smaller the capacity of the vessel is self-regulating as the volume of blood present, the greater the patient's risk of developing hypertension. The most severe cases are usually those in which the patient has a real excess volume and its vessels are unable to expand to accommodate increased pressure on its walls. In order to understand what a normal blood pressure, we must first understand how we describe the pressure values. For example, you know what it means to say that a patient has blood pressure of 120/80 mmHg? The heart pumps blood through your beats. When the heart contracts, it expels the blood inside toward the vessel. When he relaxes, turns to fill with blood. This alternating contraction and relaxation occurs on average 60 to 100 times per minute. The heart fills and empties, fills and empties ... The pressure in the artery walls is pulsatile, or increases the contraction phase of the heart and reduces the relaxation phase. The contraction of the heart muscle is called systole. Therefore, the systolic blood pressure is one that occurs during systole. The relaxation of the heart muscle is called diastole, so diastolic pressure is that which occurs during diastole. Blood pressure is at its highest during systole and the lowest during diastole. Therefore, they are also called maximum pressure and minimum pressure. The blood pressure measurement is described in the unit millimeters of mercury (mmHg). Thus, if the patient has a blood pressure of 120/90 mmHg, this means that the maximum pressure on the artery wall, which occurs during systole, is 120 mmHg, the minimum pressure that occurs during diastole, is 80 mmHg. The general public often call 12/8 (12 by 8), but in fact, the correct form is 120/80 (120 over 80), as this is the amount of pressure in millimeters of mercury. What are normal blood pressure? Our arteries were scheduled to work within certain pressure values. When the arteries are subjected to prologada order to very high blood pressure, excess strain on your walls begins to cause serious injury. Small cracks can arise in the wall, facilitating the rupture of small blood vessels and the formation of calcium plaque in larger diameter arteries. These cards, in addition to reducing the artery elasticity itself also reduces the internal gauge favoring occlusion circulation by thrombi, event called thrombosis. In addition to injury to blood vessels, excessive blood pressure also increases the work of the heart, which must pump blood against increased resistance. After years of overwork, the heart begins to dilate, leading to heart failure. BLOOD PRESSURE NORMAL - patients with systolic blood pressure less than 120 mmHg and diastolic pressure 80 mmHg. PREHYPERTENSION - patients with systolic blood pressure between 120 and 139 mmHg or diastolic pressure between 80 and 89 mmHg. HYPERTENSION STAGE 1 - Patients with systolic blood pressure between 140 and 159 mmHg or diastolic pressure between 90 and 99 mmHg. HYPERTENSION STAGE 2 - patients with systolic blood pressure above 160 mmHg or diastolic blood pressure above 100 mmHg. HYPERTENSIVE CRISIS - patients with systolic blood pressure above 180 mmHg or diastolic blood pressure above 110 mmHg. 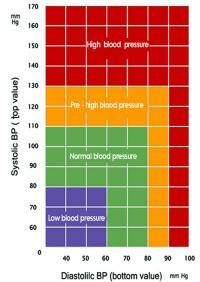 Adolescents and young adults - blood pressure should be below 140/90 mmHg. Adults over 60 who have no diabetes or chronic kidney disease - blood pressure should be below 150/90 mmHg. Adults over 60 who have diabetes and / or chronic kidney disease - blood pressure should be below 40/90 mmHg. The definition of hypertension in children is more complex because it depends on the height percentile she is. For example, a 5 year old who is in the 10th percentile in height is considered hypertensive if values persistently above 109/70 mmHg. I have a child, also 5 years, but in the 90th percentile in height must have often values above 115/74 mmHg to be diagnosed with hypertension. 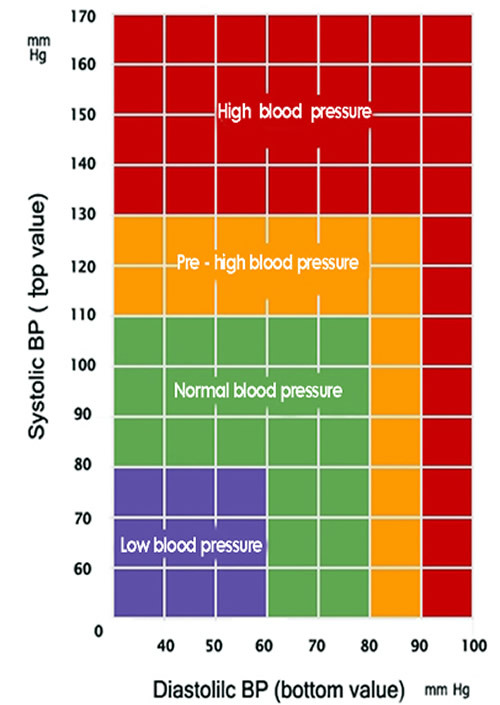 There tables with acceptable blood pressure values according to age and percentiles 5, 10, 25, 50, 75, 90, and 95 in height. There are dozens of possible values, so no one knows by heart. After measuring the pressure of the child, you need to define that height percentile she is to be able, through the table, interpret your blood pressure levels. The values of blood pressure in pregnant women should be the same as in adults in general. Therefore, normal for a pregnant woman is having a pressure less than 140/90 mm Hg. However, despite the blood pressure reference values are the same, the indication to begin drug treatment is different because there is no clear benefits to the very strict control of pressure in pregnant women, and there is still the risk of side effects to the fetus . If the pressure is of recent onset, or did not exist before and appeared during pregnancy, most physicians choose not indicate drug treatment, unless the values are above 160 mmHg systolic or 110 mmHg diastolic pressure. If after 12 weeks of childbirth hypertension is still present, then yes treatment with drugs should be considered for women with blood pressure above 140/90 mmHg. If the patient already had hypertension before becoming pregnant, she should continue the treatment of hypertension, taking care not to only use drugs that can harm the fetus. However, if the patient during pregnancy have blood pressure levels below 120/80 mmHg, medications may be reduced or suspended, provided that, with it, pressure values do not exceed the 150/100 mmHg.